Tony Breeden acknowledges the fans after his clean sheet against Blyth. 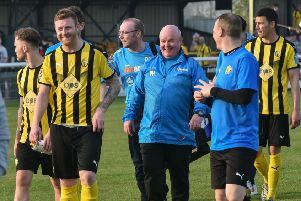 Tony Breeden has picked up the headlines for his goalkeeping exploits as Leamington have distanced themselves from the drop zone with back-to-back wins. Breeden kept a clean at Boston and followed it up with a fine display and a penalty save in the 1-0 win at home to Blyth Spartans. Breeden is first to the punch. However, the Brakes keeper is in no doubt as to where the credit should go for his side’s recent revival: loan signing Daniel Udoh. “We’ve been performing well but not putting the chances away. I don’t think we’ve got as many points as we deserve,” said Breeden. “But now we’ve got Danny and he’s different class. “I don’t want to speak too soon but I think he could be our saviour. “We needed someone to do the horrible work, run in the channels and the way he handles himself around the place, he’s just a different class. While Breeden credits the Crewe Alexandra loanee for Brakes’ improvement on the pitch, he says manager Paul Holleran also deserves accolades for the way he has Leamington punching above their weight in the National League North. In the bottom three in terms of budgets, Brakes have bloodied the noses of some of the division’s heavyweights, including Salford City and York City and Breeden says that comes from a sense of togetherness Holleran instils in his squad. “I don’t know the ins and outs but it’s one of the lowest (budgets) in the league and with seven or eight full-time teams and the likes of Stockport and Alfreton paying one player what we would pay four it’s credit to the gaffer,” he said. “He gets some stick but he’s absolutely brilliant, that’s why I keep signing for him. “We’re all on roughly the same amount of money, people are not on big dough. “He’s tough and fair and everyone know where they are with him. “The way I was when I was younger, I was a bit of a nightmare, but I liked him and knew he was what I needed in my life. For Breeden, a nightmare performance at Alfreton in January which saw him at fault for the hosts’ first two goals in a 4-1 defeat, has been quickly forgotten. The 30-year-old was ridiculed on social media for the two high-profile bloopers but has produced the best possible riposte to his critics with a string of faultless displays. And he says the ability to deal with his detractors has come with age. “It’s water off a duck’s back. “I don’t get too excited when I get praised and don’t get above my station and I don’t get too down if things aren’t going my way. “I used to when I was younger but I’ve been around a few years now and I just look to the next game and try and perform to the best that I can. Breeden ensured Leamington held on to the three points against Blyth when he guessed right to deny Sean Reid. It was the Birmingham-born number one’s fourth penalty stop of the season - to go with the one he has scored - but he says he does not have a tried and tested formula. “It varies, sometimes I say to my missus that I’m going to go left today. “Sometimes I look at a player but I’ve changed my mind a bit recently and let a few in. “Against Blyth I looked at the run up and decided there was only one way he could put it and I saved it. Two blank Saturdays have stalled Brakes’ march up the table and they return to action tomorrow with a home derby against the division’s in-form side, Nuneaton Town. Dino Maamria’s side have won six and drawn three of their last nine and Breeden knows Brakes will have their work cut out to extend their mini winning run. “I know some of the Nuneaton boys and when they play to the best of their ability they are more than a match for anyone in this division.